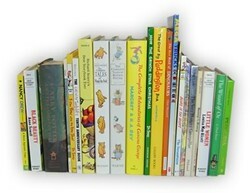 Browse a wonderful selection of children's fiction books for kids of all ages. Whether you've got young children or young adults, you'll find something here to keep them occupied with fun, educational reading material. To get you started, we've added a few suggested starting points below based on your child's age and reading level. Just visit the links under the category that your child falls into for a list of recommended reading and other helpful resources. If you're children aren't quite reading on their own just yet, we've got a great section of fun read aloud stories and books for beginning readers including books for toddlers, recommended board books and the best of Dr. Seuss. If your kids are school age and independently reading, here's a few of our top rated recommendations for early readers, children's chapters and classic literature for children. If you're just a kid looking for a good book to read, we've got a growing library of top recommended young adult fantasy and fantasy book series that you might like too. Do you or your children have a particular attachment to any special books in this category? Please do share. Our readers are always on the look out for great recommendations and we love hearing about why you love them. You can share as many or as few as you want. You can write it as a list or write a paragraph or two about the books you want to share... the more the merrier.